There's a really great car blog I read called The Truth About Cars. It's full of insider observations and commentary on the auto industry, as well as contributions about things mechanical and older autos. One of TTAC's regular columns is called "Curbside Classics", wherein contributor Paul Niedermeyer finds and photographs older rides in and around his home in Eugene, Oregon. A couple of weeks back, Paul turned his attention to one of our beloved Larks, specifically a Pepto-Bismol-pink '60 Lark VI 4-door sedan. It's a great little car, and a great review too, with plenty of history and some hilarious personal anecdotes as well. Check it out! When you're detailing an engine, it's the little stuff that makes the difference. Decals are one thing that contribute, as are correct engine accessories. In my case, the oil breather/filler caps were one of the last things to need touching. Studebaker converted to full-flow engines (that is, an engine where 100% of the lubricating oil is filtered) in late 1962. Prior to that, Stude V-8s were partial flow engines, meaning that not all the oil was filtered as it passed through the oiling system. The two engine types can be immediately identified by the location of the oil filler tubes and the valve cover design: partial flow engines have a filler standpipe front-and-center, forward of the valley cover, and the valve covers have no filler openings. 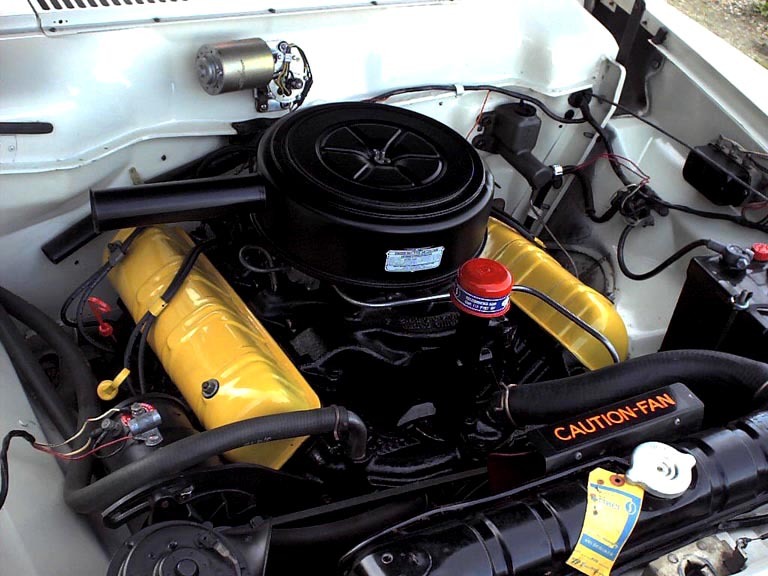 Full-flow engines have oil fillers in the valve covers and no standpipe on the block. 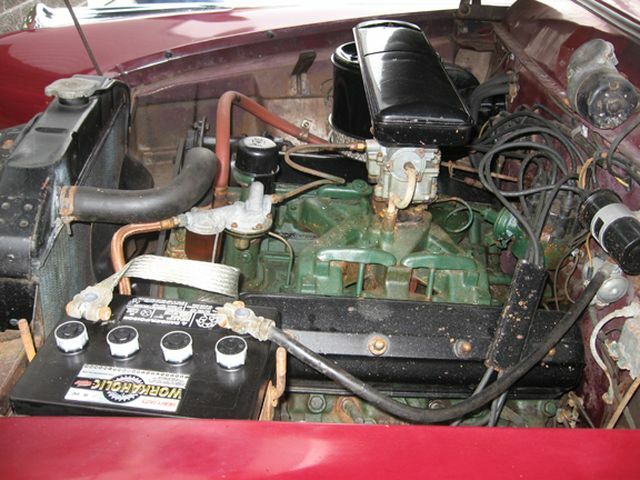 Compare the two photos below to see the difference: On the left is a V-8 installed in a '62 Lark; its central oil fill and solid valve covers mark it as a partial flow engine, while the '63 engine compartment on the left has the dual valve-cover-mounted fillers of a full-flow engine. Regardless of the type of engine installed, notice that the oil filler cap is the same in each photo: a low-profile orange cap with a blue and white label. This cap, painted orange, was used on all standard '62 - '64 Studebaker engines. A chromed version was used on Jet Thrust engines installed in all Avantis, or on Larks and Hawks that had an optional JT engine. In fact, I believe the basic design of this cap dates back to the very beginnings of the Studebaker V-8; the photo below shows a cap of similar (if not identical) design installed atop the oil filler of a pristine 7,400-mile 1951 Commander State sedan. Nevertheless, if your cap is missing, it is available as a reproduction from Studebaker vendors - but only with the chromed finish. I don't know why they don't offer a painted version, since there were far more non-JT engines produced over the years, but there it is. So if you have a pair, re-use them! Or get a used pair cheap, wash them up and refurb. Here's the quick-and-dirty makeover. When I acquired Barney, his OEM Stude breathers were already long gone, ditched in favor of a set of Mr. Gasket chromies. These work find and look OK, but they sit high; the Stude breathers snuggle down over the filler pipe and sit close to the valve covers. So I procured a used set from an SDC Forum user and proceeded to strip off the old paint. The photo here shows an original breather alongside its twin, paint removed using a nylon abrasive wheel. After the old paint's gone, the new goes on. The secret here is to use Dupli-Color DE1620, better known as Chevy Orange. It's a perfect match for the orange paint Studebaker used in several places under the hood on late V-8s. I always use a base-coat of Rust-Oleum red primer just to even things out; after that, the Orange goes on. Not a bad result! This is after a coat of primer and two coats of Orange. Now the finishing touch: the decals. These are correct for 1961-1964 caps; older ones were painted only solid colors. The decals are basically STP advertisements (Studebaker acquired STP in '61 as the Corporation began to diversify). These labels are reproduced and can be gotten from Studebaker vendors. There was some discussion on the Forum a while back as to which direction these labels were applied; some maintained that they went on so that the lettering could be read correctly with the cap installed; others swore that the labels were put on upside-down at the factory. I prefer mine right-side-up, so that's the way I put them on. It just makes sense that way, to me! The labels are self-adhesive, so no wetting and sliding of decals is needed. Here are the completed caps, ready to go. Above are before-and-after shots of Barney's engine. On the left, the Mr. Gasket breathers. As I said, they're not bad. On the right, the newly-refurbed Studebaker caps. Notice how they hug the valve covers. Also, you can see in the photo below, the Dupli-Color orange really is a perfect match for the OEM paint: the Viscous Drive fan in the photo has factory-original paint and the difference, to my eye, is nil. 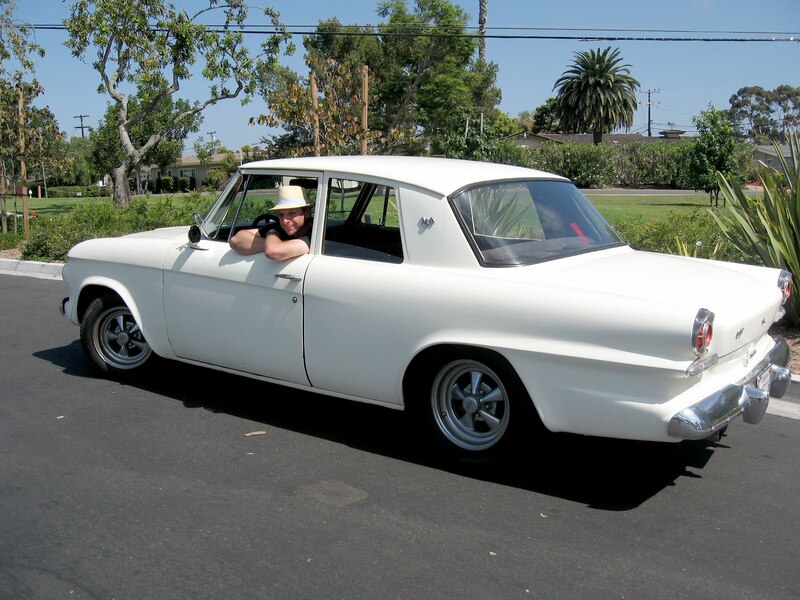 The first Saturday in September is International Drive Your Studebaker Day! Last year, Barney was unable to make it to the road owing to his lack of brakes, but today -- well, we were all over! My lovely wife took a shot of The Old Man (that's the car, not me, wiseguy) in Buddy Todd Park in the afternoon - a beautiful day for driving a Stude. But then, any day is a great day to drive your Stude! If you didn't make it this year, no worries - there's 365 to get your car ready! Now, get out there and pound some pavement! Haven't been doing a lot of work on Barney lately - just driving him a lot! It's been nice to get out on the road this summer and just bomb around. It amazes me that nearly every time I pull into a parking lot somewhere, someone comes up to me and starts a conversation! Every Starbucks visit, every trip to the bank... it's like clockwork. Most recently, I pulled up for coffee and a lady in her late 50s in a Honda Element parked next to me shouted over "Studebaker?" I affirmed, and congratulated her on the ID, saying most folks don't know quite what it is. She responded by saying "Most folks aren't as old as me!" Then she proceeded to ask where SHE could get a Lark of her own :) She seemed very earnest, and I gave her a copy of the Studebaker Story brochure and pointed her to the Forum. I have no doubt we'll see her at chapter meeting sooner or later. 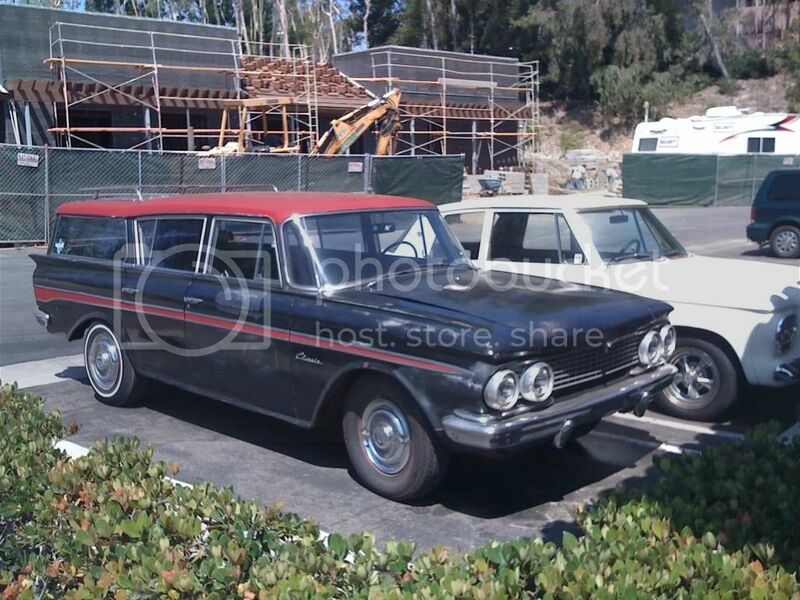 A couple of weeks back I came across a lovely red and black '62 Rambler Classic wagon. Okay, it's a little rough, but hey - it's on the road! The body was pretty rust-free, and the paint showed signs of having been patched in a few places, so someone's taking care of this Rammer. Naturally, I couldn't resist taking a photo with Barney (hiding in the back). I've since seen it around town in several places; hope to meet the owner one day. Here's another sweet Lark I found in the Home Depot parking lot, a '59 F-body. I did meet this owner coming out of the store; he's a contractor and this Lark is his daily driver since he burned up the engine on his Powerstroke Ford truck. Says it costs him a lot less to get around (although he can't haul lumber it in ;) ) It's a Custom with the vinyl interior and plain-Jane door panels, but it's a very nice dark green over tan with chrome steelies. Love it! Finally, this Saturday (tomorrow!) is the 2nd Annual International Drive Your Studebaker Day. If you've got one, get it on the road tomorrow! If not - be on the lookout for random Stude sightings. Barney and I will definitely be out and about.